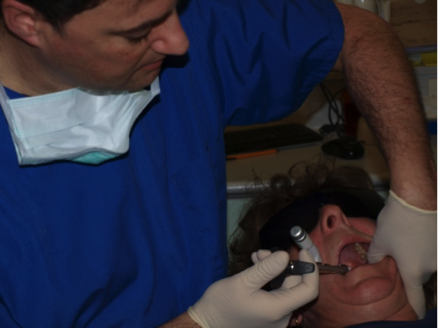 We all have our favourite methods of trying to reduce the pain and fear of local anaesthetic injections. Aside from twanging nerves, there are two opportunities to cause pain: the first is when the needle penetrates the mucosa and the second is when the fluid stretches the tissues as it is injected. 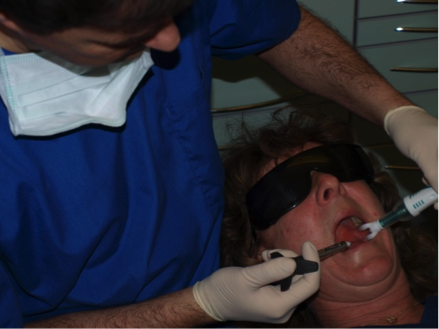 Psychology, topical surface analgesia, sharp needles and slow injection techniques are all essential to exceeding patient expectations. There are also various gadgets designed to help. In this article I will review two that are designed to exploit the Gate Control theory, and describe my experiences with each of them. What is the Gate Control Theory? The nerve endings associated with sensing temperature and pain are small, uninsulated and have a relatively low signal intensity. The nerves which respond to pressure and vibration are larger, insulated and have a relatively high signal intensity. When vibration and pain signals are combined, as in the case with an injection using one of these devices, it is believed that the ‘vibration’ message carried by the insulated nerves predominates over the ‘pain’ message carried by the smaller uninsulated nerves. The ‘tactile’ pathway appears to have an inhibitory action on the ‘pain’ pathway at the dorsal horn of the spinal cord. The patient only experiences vibration. A search of the literature reveals positive, negative and neutral conclusions! These devices certainly do not cover up poor technique. In combination with meticulous technique, I would say they definitely enhance the patient experience. Now whether this is due to distraction by the vibration and noise or the Gate Control Theory or a combination of both I could not tell you. What I can tell you is that the patient response is so positive I would not like to work without it. So how do these devices stack up against each other? The Vibraject clips directly onto any conventional syringe. I believe there is an attachment that allows it to be used with the wand as well. The battery cap is twisted to start the vibration. It can be positioned at any point on the syringe and still remain effective. This has the advantage that you just continue with your normal technique so there is no learning curve at all. The Dentalvibe is a separate unit that has a soft disposable forked tip. The tip applies vibration to the mucosa and retracts the tissue. It even has a light that illuminates the area. It is much louder than the Vibraject which is a deliberate feature to help distract the patient. In addition the frequency and strength of the vibration is varied, unlike the Vibraject. It is claimed that this increases the efficacy of the device. A real advantage over the Vibraject is that vibration is applied to the tissues before needle contact which helps with initial penetration. However, it means that you cannot use your fingers to retract or palpate structures such as the internal oblique ridge (Figures 1 & 2). This results in a seriously high learning curve. I have really struggled with this. Figure 1: Vibraject can palpate internal ridge. Figure 2: DentalVibe unable to palapate internal ridge. The Dentalvibe currently costs $995 + shipping from the USA. In addition you need to purchase the disposable comfort tips which with shipping probably work out at over £1.50 each. The tips are designed to disintegrate on removal to scupper any unwise attempts at disinfection and reuse. The Vibraject costs £199 from the UK. It uses disposable batteries. Estimated running costs are about £15 per annum. There is a conversion kit available which converts the standard Vibraject Intro Kit to a R3 rechargeable battery model. This includes two rechargeable batteries and costs £90. Clearly the Dentalvibe is much more expensive to purchase and to run, although still cheaper than the Wand (prices correct as of October 2018). Both units have stood up to prolonged usage. Historically, there have been issues with both units but customer service is outstanding in both cases so either is a good bet from this point of view. Whilst neither unit can be autoclaved, the tips for the Dentalvibe are disposable and the bracket that attaches the Vibraject to the syringe is autoclavable. Both companies have excellent websites aimed at patients. They have online directories so patients can search for a local dentist who offers the device. Promotional literature is supplied for display in the practice and both companies actively promote their devices in the media. Online video tutorials are available as well as telephone support. The Dentalvibe wins hands down here. Looks high tech, modern and cool. Lights up and even had toy animals that fit on the end to distract and reward the younger patients … what’s not to like! I have used both devices for some time. With careful application I have managed the coveted “is that instead of the needle?” response from patients. With the Dentalvibe, one has to be careful not to apply the tips to the alveolar bone as this can be unpleasant. With the Vibraject the unit can occasionally jump off the syringe and hop around the surgery floor like an old school jumping bean…. very embarrassing! One also has to be careful to avoid touching the teeth with the vibrating syringe as this is also rather unpleasant for the patient. Both work. However, the steep running costs and even steeper learning curve mean that the Vibraject is the one I now use exclusively in my practice. Author: Lincoln Hirst BDS (2013). Last reviewed and updated on October 28, 2018. Hi doctors. Have you tried placing the vibrajet on your hand that you normally shake the cheek with. This way you can create a distraction and not get arthritis. Can it be used on 3 ml plastic disposable syringes ? Like dispovan type syringes ? I believe it can as the springy wings that attach it to the syringe can be bent. I live in Georgia, USA. My dentist just got the Vibraject & I LOVE IT!!! Especially effective on the roof of the mouth! Whoever invented it has my undying thanks!! Every dentist should be using these as it cuts the injection pain to about 20%!